Swiss ETA 2824-2 Automatic Movement. 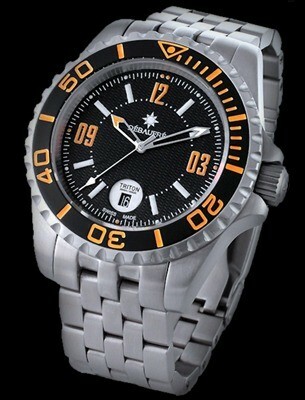 The Debaufre Triton line of dive watches are solidly built hunks of steel, that can go as deep as you need. The Triton watches will get noticed on your wrist and go anywhere you need. HI ALL,JUST RECEIVED MY TRITON 2000M WATCH.NOW THE ONLY THING I CAN SAY IS,O MY GOD,WHAT A GREAT WATCH,THE STRAP EVEN HAS A DIVERS EXTENSION.THE PREVIOUS OWNERS HAD AGREED TO SEND ME THE WATCH IN THE PRESENTATION BOX AS I HAD PREVIOUSLY BOUGHT A WATCH FROM THEM,THE NEW OWNERS HONOURED THIS,AND THE BOX IS JUST FANTASTIC AS WELL.NOW AS FAR AS SERVICE GOES,I ORDERED THE WATCH LAST THURSDAY AND I RECEIVED IT TODAY BEING MONDAY,2 DAYS EARLY.THE WATCH ITSELF,THE WEIGHT ITSELF IS JUST RIGHT,THE BEZEL FEELS GOOD AND MAKES THE CORRECT CLICKING SOUND AND THE MARKINGS ARE PERFECT.THE SKELETON HANDS LOOK GREAT AS WELL AND I LOVE THE DATE DISPLAY.I PERSONALLY THINK THAT THIS WATCH COULD SELL FOR OVER $1500 IN THE INTERNATIONAL WATCH MARKETS OF TODAY.I ALSO THINK THAT DEBAUFRE SHOULD CARRY ON MAKING WATCHES THAT ARE NOT A HOMAGE TO OTHER BRANDS BECAUSE THEY ARE A GOOD ENOUGH COMPANY WITH HIGH ENOUGH STANDARDS FOR THEIR OWN DESIGNS TO STAND UP AGAINST OTHER COMPANIES. I WOULD AND WILL AND DO RECOMMEND DEBAUFRE TO ALL MY FRIENDS BECAUSE I BELIEVE IN THIS WATCH COMPANY AND I HOPE IT LASTS FOR AS LONG AS THE OTHER WELL ESTABLISHED WATCH COMPANIES,FROM A VERY HAPPY CUSTOMER IN SUNNY ENGLAND. I am extremely happy my new Triton and Csar watches from Debraufre! The style, design and workmanship of these watches are of the highest quality. I want to THANK everyone BIG TIME at Debaufré - both in Fla. and in Utah! - for ALL their kind & gracious assistance with the return/exchange of a new watch I'd JUST received. Being hopelessly 'detail oriented', I couldn't overlook a VERY slight blemish in the hour-hand lumi. Although my wife said it was nothing (and, of course, she was right! ), I contacted 'Day-boh-fray' to arrange an exchange - which was made in a VERY professional, FAST, courteous and supportive manner! If you want to find out something about a watch co., buy one of their watches. IF you REALLY want to find out about a watch co., ask for assistance AFTER the sale! And, fortunately, in my case, I couldn't be more relieved - and pleased! I own several Debaufré's and plan on acquiring even more!